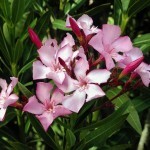 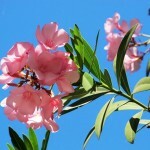 Oleander is a tough Mediterranean shrub that thrives where summers are dry and hot. 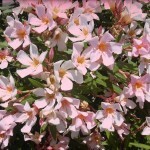 It is a large, evergreen shrub with bushy, rounded to vase-shaped habit. Leathery, linear, lance-shaped leaves line the branches throughout the year and emit white latex when broken. The colorful flowers appear all year around but bloom most heavily from late winter to early summer. 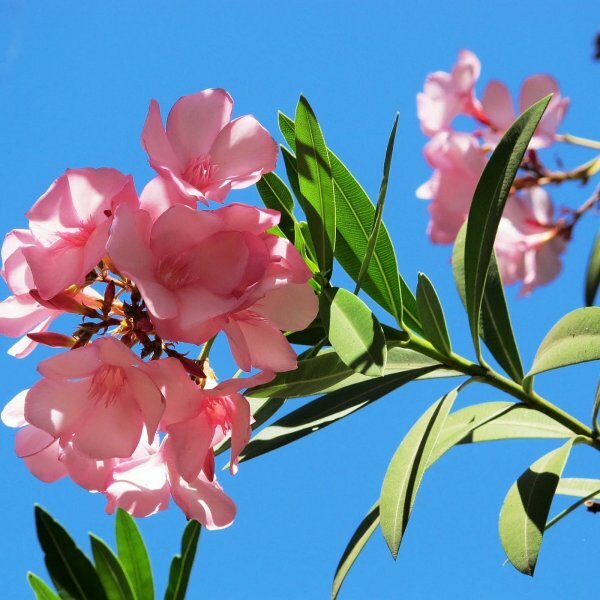 They are borne in loose clusters at the ends of the branches and are funnel-shaped at the base with five prominent radial petals that flare at the mouth. 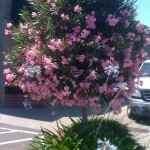 There are lots of colors to choose from in shades of red, pink, and white.